Florida manatee, Trichechus manatus latirostris, a subspecies of the West Indian manatee, endangered. 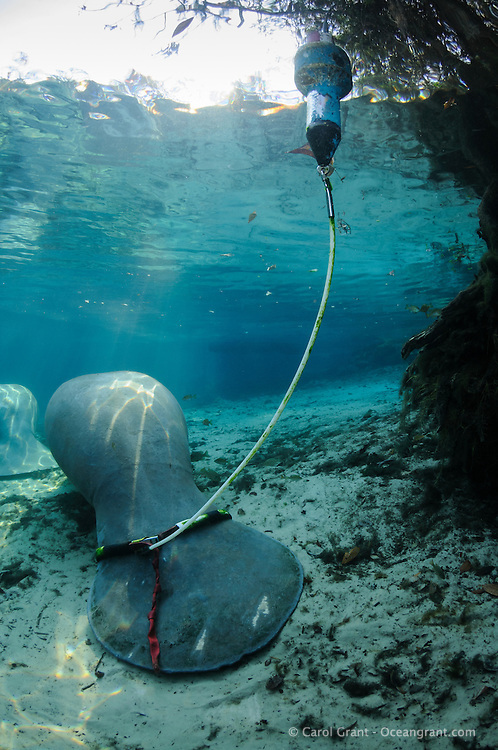 A manatee with a radio tracking buoy rests in warm sun rays near a blue freshwater spring. A few scars are apparent on its tai. Vertical orientation with blue water, reflection,and rainbow sun rays with submerged tree roots. Three Sisters Springs, Crystal River National Wildlife Refuge, Kings Bay, Crystal River, Citrus County, Florida USA.